Armstrong has been San Francisco Bay Area’s leader in residential and commercial painting for more than half a century. We are proud of the fact the over 30,000 homeowners and some of San Francisco’s most prestigious business and institutions have trusted us to paint their homes and offices. What most people don’t realize is that for a painting contractor to be able to excel in both residential and commercial painting is not as simple as it may seem. There are numerous differences between these two painting categories, with the most obvious being the size of the task and the equipment and know-how needed to produce the desired result. Residential painting focuses on painting exteriors and interiors of homes which is much more personal than commercial painting. Our residential painters are experienced in helping our clients choose the most suitable color combinations and paint quality to match their lifestyle and budget. Residential painting is also more relaxed and detail-oriented. At Armstrong, we want to help you transform a home from ordinary to extraordinary without spending a lot of money on remodeling. Commercial painting, however, involves painting larger exterior and interiors areas and more (and sometimes specialized) equipment to get the job done. It can include painting factories or other industrial building but also offices and apartment buildings. Unlike residential painting, our crews of commercial painters are production and efficiency oriented. For commercial painting projects, Armstrong uses our exclusive AWS Specified Formulation. Coupled with our thorough preparation, Titanium-Acrylic paints and our unmatched attention to detail, we provide businesses with unparalleled protection and one of the most comprehensive warranties available. Commercial painting normally involves painting large spaces which need to be painted during hours which will minimize the impact on a business. In order to complete the work on time, commercial painting crews consist of more painters who are willing to work at night or weekends. 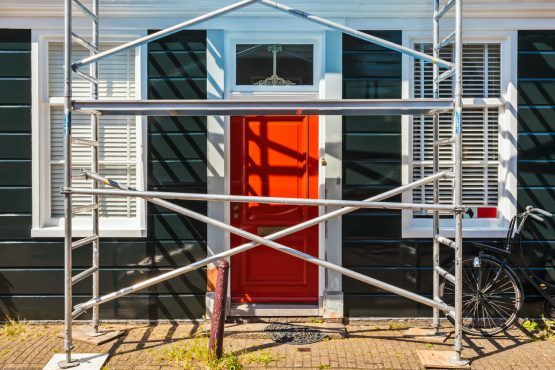 On the other hand, residential painting crews can smaller since the project could only involve painting the exterior of a single-storey residence. The time needed to complete the work is usually much less than commercial projects, so as a result, crews work during normal business hours Monday through Friday, but at Armstrong painting our crews can also work with your schedule to minimize the impact on your personal time. A commercial painting company like Armstrong can offer its commercial clients a wide range of services. For example, commercial painting, in addition to interior/exterior painting and coating, may involve sandblasting, power washing and surface preparation. Commercial painting is often much easier than residential painting as larger buildings have larger flat surface areas with few details whereas homes have more complex surface areas and details which may require time and special skills. Our experience in both types of painting has, consequently, enabled us to apply our residential painting skills and know-how to produce a higher quality of painting results for our commercial clients. At Armstrong, we also offer our clients premium grade all-weather and commercial paint and coatings that are specifically designed for a wide range of materials including concrete, metal and all of the typical materials which are not normally found in homes. Commercial properties or buildings with high-traffic areas require more durable paint products or other protective coatings to endure the wear and tear not usually found in homes. However, Armstrong also offers industrial grade products for residential homes as well. These industrial grade products, especially those designed for exterior surfaces, can provide more value for money for any homeowner. As we have already mentioned, commercial painters usually have tight schedules. Therefore, professional commercial painters need to have the right equipment such as industrial painting tools, cherry picker cranes and scaffolding for high tasks. This type of equipment enables us to complete any job efficiently and on time. During our more than 50 years of painting experience, Armstrong Painting has acquired the knowledge and skills to complete both residential and commercial painting jobs efficiently, on-time and to the full satisfaction of our customers. Our experience with both types of painting jobs has enabled us to provide the highest standard of painting services available. For example, our exceptional communication skills and attention to details required for residential jobs have also been useful in providing high-quality services for commercial clients like small shop or restaurant owners who expect finer details which may not be provided by strictly commercial painting companies. Similarly, our ability to provide a wide range of painting services and material, to work efficiently and complete commercial work on time is greatly appreciated by our residential clients since we can offer them options which are not normally offered by strictly residential painters. Our painters, at Armstrong Painting, have experience in both residential and commercial projects. As a result, we can apply our cross-type experience to benefit both residential and commercial clients. If you are considering repainting your home or business, put our 50 plus years of knowledge and experience to work: arrange for your Free Estimate now!